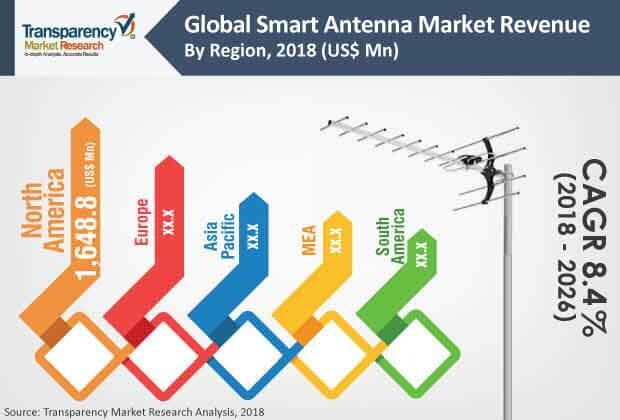 The global smart antenna market was valued at US$ 4,909.4 Mn in 2017 and is anticipated to register a stable CAGR of 8.4% during the forecast period 2018 to 2026, according to a new report published by Transparency Market Research (TMR) titled “Smart Antenna Market– Global Industry Analysis, Size, Share, Growth, Trends, and Forecast, 2018–2026.” Increasing application of smart antennas in smartphones and growing demand for smart antennas in wireless communication has increased the penetration and growth of the smart antenna market globally. The market in North America is expanding at a significant CAGR of 8.8% on the backdrop of numerous technological innovations in communication technology. Growing popularity of smartphones is ultimately resulting in high demand for smart antennas worldwide. Smartphones have become a viable alternative to laptops and personal digital assistants (PDAs), offering features such as SMS and voice messages coupled with multimedia functionality, internet applications, inbuilt GPS capabilities, and high data processing capabilities. Huge investments and advancements in technology are boosting the demand for smartphones globally. The growing requirement of quick data transmission and high speed of downloading and web browsing will continue to create heightened demand for smart antennas. By technology, the smart antenna market has been segmented into SIMO (Single Input Multiple Output), MIMO (Multiple Input Multiple Output), and MISO (Multiple Input Single Output). Due to its higher spectral efficiency and link reliability or diversity, MIMO has evolved to become an important part of modern wireless communication standards such as HSPA+ (3G), Long Term Evolution (4G), WiMax (4G), and IEEE 802.11n (WiFi). MIMO held the largest share of the market in 2017. By type, the smart antenna market is classified as switched multibeam antenna and adaptive array antenna. In 2014, adaptive array antenna was the largest contributor to the market. Dominance of the market by adaptive array antennas is expected to continue during the forecast period. However, the switched multibeam antenna segment is expected to expand significantly during the forecast period. Switched beam antenna systems offer significant increase in capacity and coverage as compared to conventional antenna based systems. Geographically, the global smart antenna market is divided into five major geographical regions. These include North America, Europe, Asia Pacific, South America, and Middle East & Africa. In 2017, North America was the topmost revenue generating region followed by Europe.The demand for smart antennas has been the highest across North America due to the prominence of the telecommunications industry in the region. Furthermore, technologies such as radio frequency identification and ultra-wideband are in great demand across the US and Canada. The U.S. held highest market share in 2017 in North America and is estimated to expand at the highest CAGR during the forecast period.The market in Europe is anticipated to grow at a significant CAGR during the forecast period due to advancements in the domain of wireless connectivity across the region.The smart antenna market in Asia Pacific is expected to expand at the highest CAGR of 9.1% over the forecast period. The growing need for faster data transmission in modern communication systems with high speed downloading and web browsing has forced companies to improve the efficiency of wireless transmission and this has enhanced the consumption of smart antennas in China and India.